Here are some tips to keep your house cool and save on your power bills this summer, as well as home improvement projects to tackle when it’s too hot to work outside. Try these tips to keep your house cooler and lower your energy bills this summer! Lower blinds or close curtains on the sunny side of the house during the day to reduce solar heat gain in your home. Planting deciduous shade trees, such as oaks and maples, on the south and west sides of your house is a great long term solution to block the sun’s rays. Performing routine maintenance on your air conditioner is essential to keep it working efficiently. Start by having your AC unit inspected by a quality HVAC pro, such as those from Carrier, to make sure the unit is working properly. Next, replace the air filter every month or two during the summer to allow your system to operate at peak efficiently and keep the air in your home clean. If the thermostat on your air conditioner hasn’t been replaced with a programmable model, such as the Carrier Côr™ thermostat you’re spending up to 20% more cooling your home. Programmable thermostats automatically adjust the temperature in your home when you’re away and lower it back to a comfortable level before you arrive home. 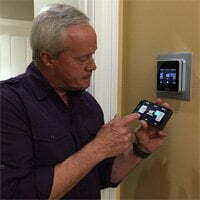 The Côr™ thermostat is Wi-Fi enabled to allow remote access from a smartphone or tablet. It also features smart setback which allows the thermostat to intelligently adapt to changes for even greater energy efficiency. Fans are a great way to create an artificial breeze to cool you down, but they only work when standing in front or under them, so turn fans on only when you’re in the room. To heighten the cooling effect of ceiling fans, set the motor so the blades rotate counterclockwise when looking up at the fan. Houses today are built tighter than ever, which is great for improving energy efficiency, but it can also trap polluted air in your home. To improve indoor air quality, run bathroom vent fans during and for 15-20 minutes after bathing or showering, and kitchen range hoods when cooking. Another way to improve the indoor air quality in your home is by installing a central vacuum system, such as the PurePower™ Seriesfrom NuTone. Unlike canister and upright vacuums, which recirculate the air in your home, a central vacuum system exhausts the air outside. 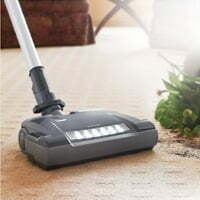 In addition a central vacuum system is much quieter to operate. NuTone PurePower Series Central Vacuums are available in three different sizes, delivering from 500 to 650 air watts of power. Rather than braving the heat outside, this is a great time to catch up on some often overlooked interior home improvement projects. Relive your favorite family memories by turning a wall in your home into a family photo gallery. Save money by matting and framing the photos yourself. To decide on the layout of the pictures on the wall, apply Repositionable Glue Dots to the back of each frame, then position the frames in the desired location on the wall. When you have all the photos where you want them, mark each location with painter’s masking tape, remove the pictures from the wall, and hang the frames with picture hangers. You’ll be amazed at how much difference updating the hardware on your kitchen cabinets or bathroom vanity can make. Start by measuring your existing knobs or pulls or taking one with you to the home center to make sure the new hardware you buy will be large enough to cover the footprint of the old hardware. Next, stick Advanced Strength Glue Dots to the back of the new cabinet hardware to hold it in place in the desired location, then use a cordless drill to screw the new hardware to the cabinets. 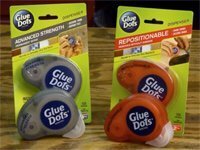 Advance Strength Glue Dots can also be used for a number of household repairs, including attaching moldings and holding loose tiles in place.